Zenith (a media agency) tracks this info on a global scale (I’ve not found other sources). They’ve only been publishing reports for the last four years, but I found a Recode article that interviews the head of forecasting at Zenith (Jonathan Barnard). This article provides historic data back to 2010, and forecasts to 2019, contrasting North America with the global average. The article was published in May 2017, and Zenith published a new report in 2018 with slightly different data for the last few years and looking forward, but the most recent report does not provide the context of the previous 10 years. For consistency of methodology, I’ve just used the data quoted by Recode for the following extrapolation. citing Zenith (appears to be from their 2017 report, including historic data available not freely accessible). Here are excerpts from the press releases for the annual “Media Consumption Forecasts” by Zenith. 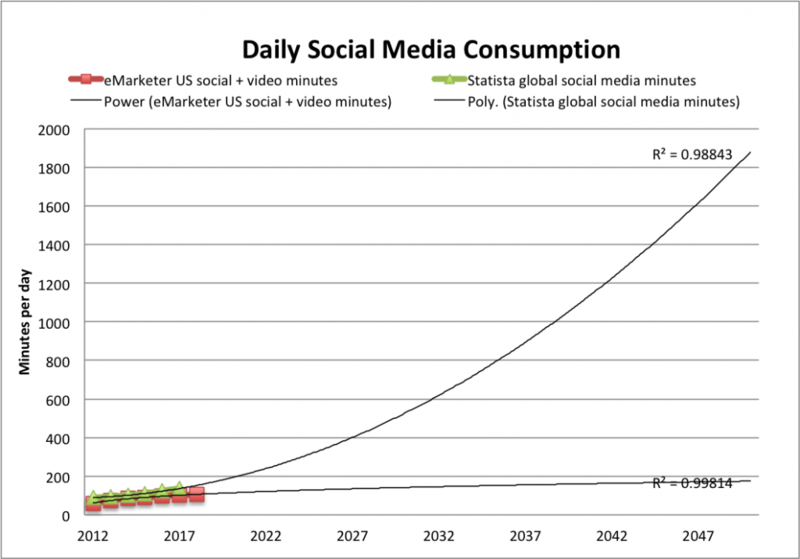 eMarketer and Statista both provide estimates of daily social media consumption. The eMarketer figures cover the US, and the Statista figures are global. Upon first inspection of the data, the Statista figures seem to be roughly 3X higher than eMarketer’s figures, a disparity that does not agree with my understanding of the variation by country (see We Are Social chart below). I’m quite confident that Statista’s data actually comes from marketing firm Global Web Index, and their recent report (which does not include all the historic info available at Statista) makes frequent passing reference to the increasing amount of time users are watching video on social platforms. In reading various qualitative discussions of social media use, I find many sources group YouTube and Facebook minutes of use together under the social category. When eMarketer’s social and video minutes are combined, they come in closer range to Statista’s figures, so I believe this is a good rough approximation. I also noticed in reading qualitative discussions that Facebook and YouTube’s average daily minutes are very similar, with video getting a bit more time, and this is also the shown in eMarketer’s data, with the gap slowly widening in video’s favor. 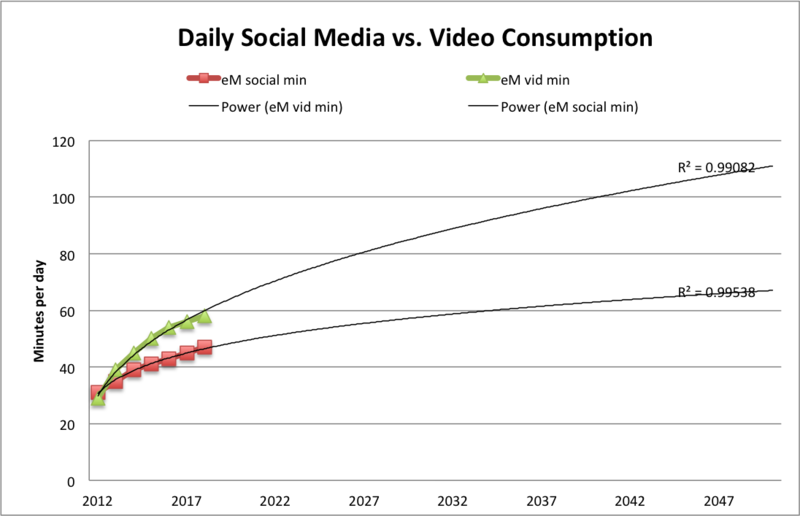 I’ve extrapolated eMarketer’s social and video figures separately to show how that divergence might take shape (again, the power trendline seemed to fit best). No surprise to see video pulling ahead of social, and I’m certain that marketing research focused on the growth of online video would suggest a much steeper curve. 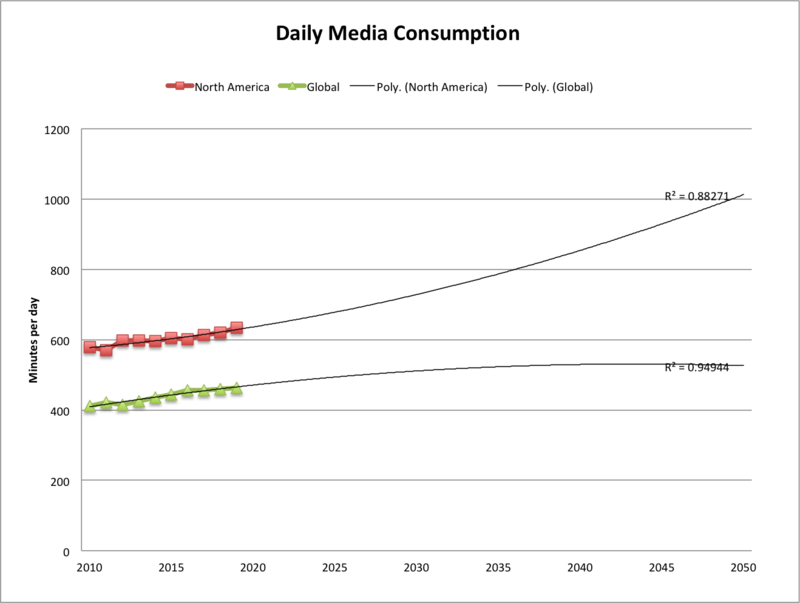 Meanwhile, and also no surprise, here’s a chart (from Recode, citing Zenith) showing that Internet consumption is overtaking traditional TV consumption (from the same source as the Global/N.American overall media consumption figures above). 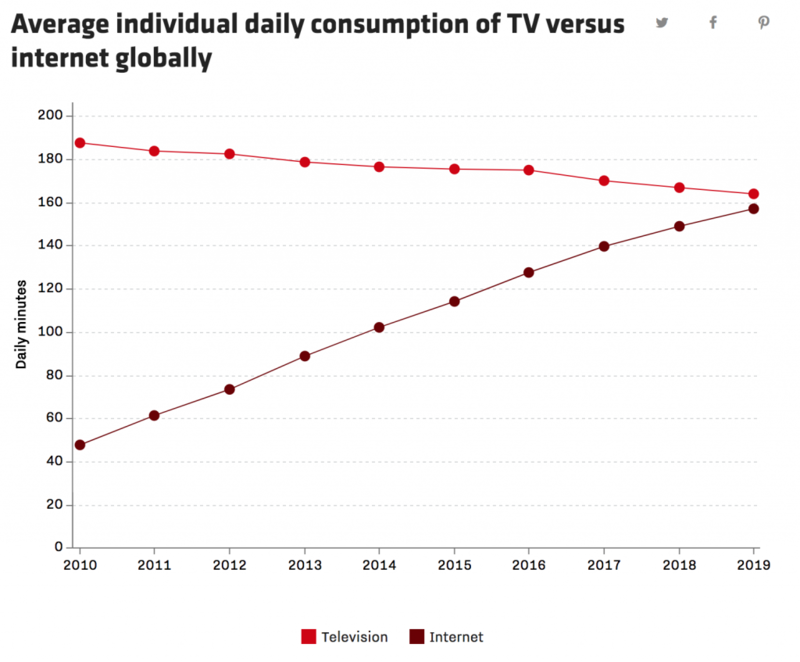 Another ad media firm, GroupM, also predicts online time overtaking traditional TV this year. Here’s a snapshot from We Are Social showing how social media consumption varies from one country to another in 2017.
eMarketer aggregates data from various research firms and they don’t offer much detail (at least, not to unpaid customers). I don’t know if these figures are based on consumer surveys or if they are based on data provided by service providers. Statista does not give the name of the original source (to unpaid customers), but they do specify that this data is based on worldwide, online consumer surveys of adults aged 16-64. 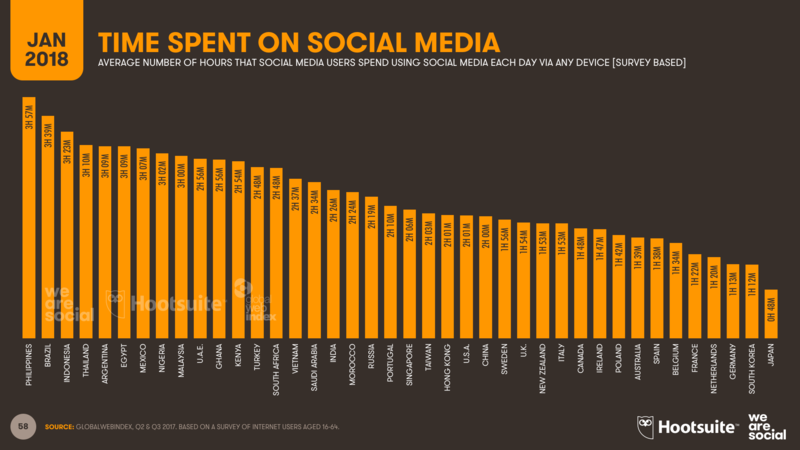 Statista also reports that the survey question asks, “Roughly how many hours do you spend engaging with/connected to social networks or services during a typical day?” The source must be GlobalWebIndex, which conducts web-based surveys. Their latest report (2018) estimates current social media time exactly as reported by Statista. Their press release here describes the same survey question, and the same survey audience (16-64 year olds).